A people’s peloton of more than 5,750 bike riders swarmed over the Great Ocean Road today – all in the name of cycling safety. The record field assembling for the fifth edition of the Wiggle Amy’s Gran Fondo, supporting the Amy Gillett Foundation, providing a once a year opportunity to ride on a fully closed Great Ocean Road. The participants included some of Australia’s fastest amateur cyclists across all age groups from 16 to 65+s vying for a place on the start line at the UCI Amateur Road World Championships in Perth in 2016, along with Australia’s best female riders at the front of the peloton competing in Amy’s Otway Classic event. If the 5,750 riders participating in the 110km Wiggle Gran Fondo and 40km Australian Unity Medio Fondo weren’t already short of breath, they experienced the breathtaking views of the Bass Strait along the Great Ocean Road. Leaving the Medio Fondo riders in Apollo Bay, Gran Fondo participants embarked on several taxing climbs in the Otway Ranges. In the process riders experienced a stunning change of scenery, with sea views replaced by a dense forest canopy that covered riders all the way to the finish in Benwerrin. Meanwhile 300 mums, dads and their kids enjoyed the Australian Unity Family Fondo, which featured 14km of closed Great Ocean Road, turning around at Cumberland River and returning to Lorne. The weekend commenced with the inaugural Amy’s Criterium presented by Europcar, part of the two day Amy’s Otway Tour as part of the Subaru National Road Series. The 36 lap hot dog circuit on Mount Joy Parade was a helter-skelter affair with High5 Dream Team rider Georgia Baker taking the win, the Tasmanian edging out Subaru NSWIS NKC’s Ashlee Ankudinoff with Total Rush Hyster’s Ruth Corsett in third. Baker collected 45 handy bonus seconds to take into the road stage. 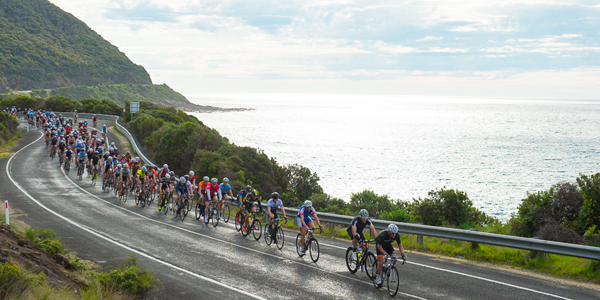 The 60-strong Amy’s Otway Classic field headed off ahead of the 5,500 strong Gran Fondo peloton, with Australia’s best cyclists enjoying the expanses of the Great Ocean Road on their 110km journey to Benwerrin. Total Rush Hyster’s Kate Perry outfoxed her rivals to take the win in Amy’s Otway Classic. Launching an attack from the breakway group of 12 riders with 10km to go Perry opened a 55 second gap with 5km to go, stretching away to win by 1minute 28 seconds. “Our plan was to launch before the bottom of the climb, and I did, and I was lucky that we got a gap and didn’t look back,” Perry said. Holden Women’s Cycling rider Miranda Griffiths headed the small bunch sprint for the podium to finish second with Amy’s Criterium winner Georgia Baker in third. Perry finished in the bunch 2mins 56 seconds behind Baker in the criterium on Saturday – meaning Baker’s third place in the classic was enough to ensure the overall Amy’s Otway Tour win. 2014 runner-up Ruth Corsett claimed the Queen of the Mountain jersey ahead with Laurelea Moss of Holden’s Women’s Cycling taking the Sprint Queen crown. “I love to ride to honour Amy and to share the weekend with 6000 other cyclists,” Mullins said. Mark Textor chairman of the Amy Gillett Foundation took the opportunity to talk to numerous participants as he rode the 110km course. “I must have spoken to 200 or 300 riders and they loved it, really appreciated the great community spirit here in Lorne, great course and conducted safely,” Textor said. It is expected that the record field will raise more than $50,000 for the Amy Gillett Foundation and inject more than six million dollars into the Surf Coast and Colac Otway Shire economies and would not be possible without the support of the State Government and its funding contribution through the Significant Sporting Events Program and the support of the Colac Otway and Surf Coast Shires. Over 30% of participants come from interstate, emphasising the allure of the Great Ocean Road as a cycle-tourism destination. Surf Coast Shire Council Mayor Margot Smith said Amy’s Gran Fondo was a rare opportunity for cyclists to experience the magnificent Great Ocean Road without cars which provides a significant economic boost for the region. “Feedback received from participants shows they are keen to come back other times of the year for recreation and holidays,” Cr Smith said. Click here for the full race results from all events. On the Saturday before the event, the inaugural Amy’s Wall powered by Subaru provided the perfect warm-up for the weekend. The 110m section of the iconic Bay Street hill. The heats saw riders take off from a standing-start, hitting more than 20% in the first brutal metres of the climb, with current Australian road and mountain bike champion Peta Mullens defending her Amy’s Wall women’s crown with Lynton Zawadski taking out the men’s event. Born out of tragedy following the death of Australian cycling team member Amy Gillett, who tragically lost her life when hit by a car during a training ride in Germany in 2005, the Amy Gillett Foundation was formed with a single purpose – to make bike riding safer. The Foundation is Australia’s leading bike safety organisation and aims to achieve zero bike fatalities in Australia.